So far this year we've had 27 planting days involving 20 schools, and with the wonderful extended rains, we are launching into a few extra school planting days next week. Well over 1000 students have been bussed out to the Lurg Hills and more than 12,000 seedlings have been planted. The daily planting achievements were quite high, frequently in the 500 to 850 range once again, because we doubled up classes wherever possible. This has the educational advantage of giving students a real sense of achievement and empowerment as they look back at the end of the day to see the enormous amount they’ve done. Doubling up classes also saves on bus fares, which is crucial now that fuel prices have gone up considerably! We always present educational sessions for the students while they are out in the field, to capture their imagination and increase their connection to their local environment. Your funding assisted greatly with these bus fares and educational experiences, and I’m sure many schools would not be able to participate without that assistance! Our community planting weekends attracted 60, 80, 40 & 115 people respectively. The energetic bushwalking groups and university students enabled us to plant approx. 11,800 seedlings over the 4 weekends. Again we give ecological presentations to the volunteers during tea breaks, to increase their appreciation of the particular values of each restoration site, and how their efforts are strategically focussed to give the best outcomes for our threatened species. Your funding assisted greatly with the catering, which was expertly provided by the staff and students of the local TAFE hospitality course. This connection is a wonderful win-win situation for all concerned! Our planting volunteer numbers were significantly reduced this year, due to a clash with the federal election, a wash-out on the floods weekend, and finally another clash with the re-scheduled football grand final!! In answer to our call for emergency assistance, 30 willing helpers joined us in late September to plant the major portion of a huge creek site that was just too big for schools to tackle. With no further schools to call on since late October, our small team of regular local volunteers has forged on to complete a number of smaller scale planting sites that were too small to send in a school group. These very effective work parties have worked hard (without the assistance of tractor rip-lines), planting on seriously degraded erosion gullies to stabilise the soil as well as creating habitat. A typical day has involved only 3 - 5 people and planted 150 - 200 seedlings. One of this year’s big sites had to be cancelled following the death of the landholder. The family of this well-respected local farmer felt unable to cope with any further tasks for the time being, so we set into motion all the plans for ripping, spraying, fencing and planting another important site that had been on the list for next year. 10 days later the 6 hectare site was ready to go and we had the pleasure of working with 115 enthusiastic people who put 4,600 plants securely in the ground in just a day and a half!! As much as anything else, it demonstrated once more just how supportive the community is, and especially the contractors (local farmers in fact) who dropped everything to get the jobs done in time. We work with an amazing variety of people and it’s simply inspiring to experience the energy and sense of community in such a group! 9 sites were direct seeded using mattocks to chisel a divot in the soil, and another was done by machine towed behind a 4WD wagon. We use direct seeding quite selectively whenever we want to establish the missing understorey species amongst remnant trees, because in those circumstances the moisture competition is too severe for planting to succeed. We also sprinkled fine seeds such as Everlasting Daisies, Kunzea, Calytrix etc in the better native grass areas on these sites. The open soil patches between individual grass tussocks provide the perfect micro-climate for seed germination, so we expect massive cover of these under-represented species by next spring! We had already observed germination on last year's direct seeding sites as early as 5 weeks ago, and there'll be a whole lot more now that we've had so much good rain and warm sunshine. This year is just perfect for plant growing!! In addition to our rare birds and mammals, the Lurg Hills has quite a number of plant species that are rare or drastically reduced, and these need protection just as much as the wildlife. Careful seed collection and scrupulous propagation leads us to the wise choice of safe sites where these species have a good chance for on-going self perpetuation. We've again chosen weed-free areas within our fenced planting sites, and planted hundreds of these rarer seedlings including Leafy Templetonia, Deane's Wattle, Tall Grass Tree, Hoary Sunray, Native Flax, White Cyprus Pine, Spur Velleia, Basalt Podolepis and Swamp Billy Buttons. To minimise the chance of in-breeding, we've gathered the broadest range of seed genetics available to us for each species, and will add to them as further seed sources are found. So as well as making high quality habitat, these sites will be very important seed sources for our revegetation work in future! We work mostly with primary and tertiary students, but apart from 2 notable exceptions, the secondary level has remained largely untapped. This is partly because curriculum timetabling pressures are much more difficult in the secondary setting, and perhaps because adolescent interests lie elsewhere! In any case, this age group has been a significant missing link in the volunteer age spectrum. So this year I've been delighted that several secondary teachers from Benalla and Wangaratta have chosen to involve their senior Geography, Outdoor Educ and Agric-Hortic students in our project. These curriculum areas clearly have an environmental focus, so it's great that students are being given an opportunity to learn about local ecological issues and then get involved in the on-ground action. I've offered several items for publication in the local Lurg community newsletter to get useful ideas out to a wider audience than I currently know. This includes celebratory news about the Babbler population boom in Lurg, the underlying causes of tree dieback and mistletoe infestations, and how farmers can tackle these issues in such a way that natural processes are working for them rather than against them!! The Goulburn-Broken CMA is featuring our project in their Annual Report as a case study that demonstrates best practise in landscape restoration. This is extremely good ratification of our work, as it comes from the peak body which sets all the biodiversity priorities for our entire region!! The next Victorian Landcare Magazine will feature an article of mine on "Biodiversity on the Farm", which aims to show the concrete benefits of biodiversity for farming. I have worked hard to spell out these ecological ideas in simple everyday language, so it's great that they are being made available to such a wide community of Landcare people. I have already talked with or visited about 25 landholders about projects for 2011 and there are more in the early planning stages!! The focus is (as always) on enrichment plantings to add the missing understorey, connecting remnants, widening narrow remnants to buffer them from external disturbances and boost their habitat value, planting densely to break the dominance of aggressive Noisy Miners, and planting on fertile soils to produce better wildlife food reserves. The special Scouts' Planting Weekend of 2009 attracted about 20 participants, this year it went up to 45, and will obviously continue to grow as groups learn about this event that is specifically designed to cater for their aims. As well as planting for a day, the weekend includes nest box checking, water quality monitoring, camping and just plain having fun in the bush. We have also run 2 planting weekends specifically for Bushwalking Victoria, to celebrate their 75th anniversary of this umbrella organisation and also provide an opportunity for bushwalkers to meet other walking clubs from across the state. So we are now planning a special planting weekend for bird lovers to come and plant for a day then go searching the Lurg district for all the rare birds we have to offer. This is a wining recipe that has many possibilities!! The Birds Australia survey once again broke a record, sighting 128 bird species in a day and a half!! The organisers Dean Ingwersen and Chris Tzaros, are quick to point out that there appears to be no other place in Victoria (or perhaps even Australia) where a rural landscape is supporting such a diverse bird population. It certainly validates our long term input to shore up the existing habitat and improve the breeding potential of many species that are doing it tough in these drier years. We will prune serious mistletoe infestations from another 4 sites on 2 properties. The good rains this year will enable the trees to re-sprout quickly and hopefully produce massed flowering next year. The recovery of ground flora in our 2008 thinning site will be monitored through quadrat surveys in the next 2 or 3 weeks when planting is over. We'll work on both private land and roadsides to remove invasive species such as Tagasaste, Hawthorn, Prickly Pear, Cootamundra Wattle, Golden Ash and Poplars. An insightful view of our biggest planting weekend in a decade - people at work and play! • Seed collection, cleaning and storage of the mass of seeds collected in late 2010. This includes a targeted effort to collect from all the rarer species that need propagating and planting in safe sites while their genetics are still with us! • Propagation with schools is always a prime focus early in the year, to ensure the seedlings are big enough in time for winter planting. • We have already worked 7 days with schools and have booked many more over the next few weeks. • To date we have propagated over 26,000 seedlings, involving ca 620 students and 3 Green Corps teams. • Liaising with teachers from several schools about ways to engage extra classes (and indeed extra schools) that have not been involved in the past. This gives us a bigger student body to help with on ground works, and also enhances the learning opportunities for students across the curriculum, by involving teachers from new subject areas. • Our nursery manager (Andie) has introduced several new processes in seedling propagation, to produce quicker growth rates and make it easier for students. The students are enjoying the change and intelligently utilising both the older skills and the new skills to suit seedlings of different sizes. • The decision late last year to focus on specific watering and fertilising for each plant species, is already producing improved health and growth!! • The 2nd shade house is underway, with extra hoops ordered to enlarge the igloo frame that was donated to us late last year. • We have already ordered the extra shade cloth and received a donated 2nd hand igloo plastic cover to protect the newly potted seedlings. • We have also received a donated garden shed to replace our older one that was destroyed in a severe storm late last year. One of our volunteers has done the formwork for a cement slab and the Green Corps team will assist him with the shed construction next week. • Booking farm visits to finalise the list of projects for 2011. • Begin measuring and mapping the layout of each site to arrange local CMA grants for landholders. • Finalising with VicRoads, the design and installation of crash guards on the median strip the Hume Freeway at Glenrowan West. The guards will protect our planting site that will become a strategic Wildlife Crossing. • Arranging the Green Corps teams from Benalla, Wangaratta and Seymour to assist with propagation and fencing. • Arranging with one of local volunteers to repair the under-strength shelving in our planting trailer. • Liaising with a specialist subgroup of our volunteers to re-think the design and structure of our nestbox monitoring database. This will enable us to more easily tease out trends in population distributions, seasonal movements of each species, habitat preferences, and correlations with landscape features or vegetation types. • Supporting an honours student with detailed design and implementation of her research into the ecological sustainability of our older planting sites. The quadrat studies are investigating the level of natural regeneration from our original planted understorey and looking for the most important ways to enhance the process. • Seeking business sponsorship for solar panels, water pump, pipes and stock troughs. This will enable us to fence livestock out of a small creek and therefore complete a strategic wildlife corridor. • Arranging mistletoe pruning contractor to start work on 3 major sites. This will utilise the unexpended monies from 2010 as well as the 2011 allocation. • Commenced fence repair works to secure the old southern boundary of our biggest planting site from 2010. The 1997 fence was poorly constructed by the previous owner, and didn't match the standard of the new fence protecting last year's planting on the northern side. • Arranging the Beechworth Prison work crew to assist with some of our 2011 fencing projects. • Arranged sponsorship from a local quarry for crushed rock to secure the stock crossing in a major creek site from last year. 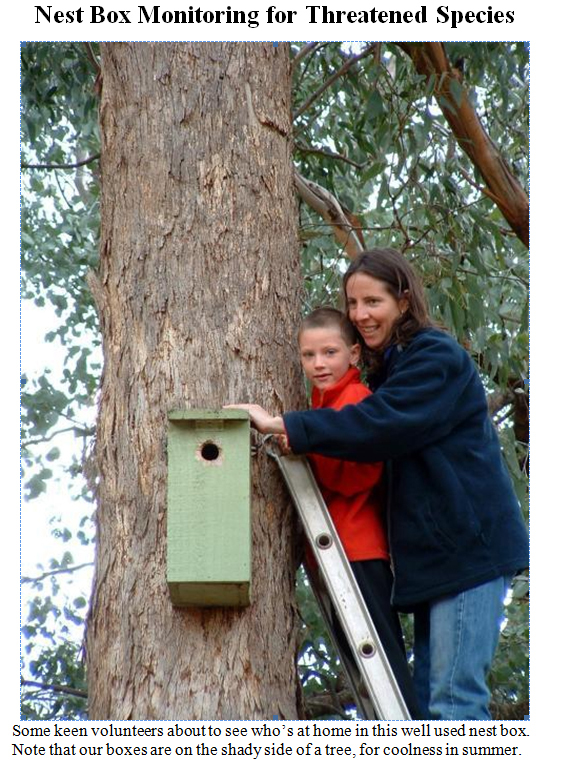 • Contacting schools, landholders, volunteer groups and the media, inviting people to our nest box checking weekends. • Briefing the Benalla Shire's new environment officer and project officer on biodiversity values for the Shire, critical threatening processes, and helpful strategic directions they might take in their forthcoming "Environment Strategy". This was by invitation only, so it clearly indicates the value they place on our input!! • Contacting bushwalking clubs well ahead of time to help them plan ahead for our planting weekend dates. • Report writing for various funding bodies on our 2010 achievements. Our nest box program has been in operation for over 13 years now and we’d love to invite you to join us as we do our annual monitoring work. 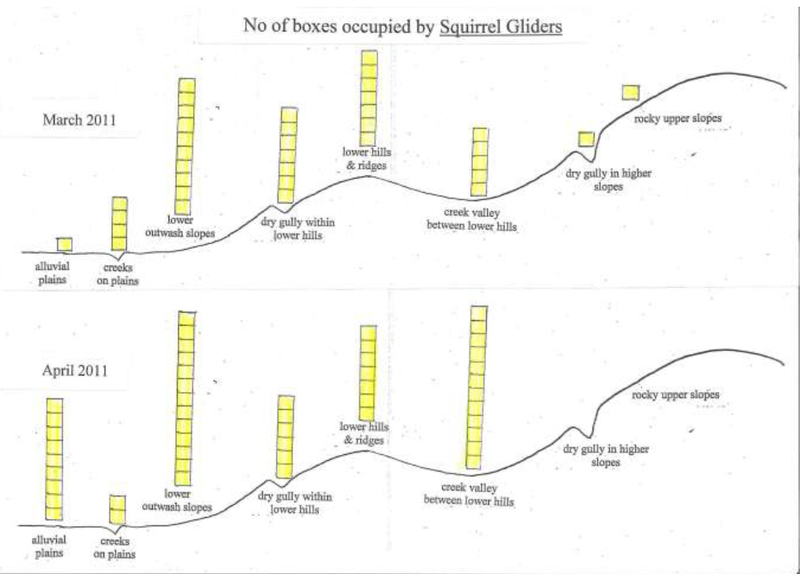 We have 381 boxes already in place, with Squirrel Gliders and Sugar Gliders nesting in about 2/3 of them! We’re also finding more and more stringybark nests of the rare Brush-tailed Phascogale, so we’re hoping to see some of them face to face when we go checking this year! The basic problem facing all of these animals is an extreme shortage of natural tree hollows, because the old trees were heavily cleared decades ago, and the regrowth forests are still far too young to have many hollows. As well as checking the older boxes, we’ll also be placing some new boxes to help the animals move around the district in search of better food reserves. This is critical for breeding females, as they need the best food to provide enough milk for their babies. 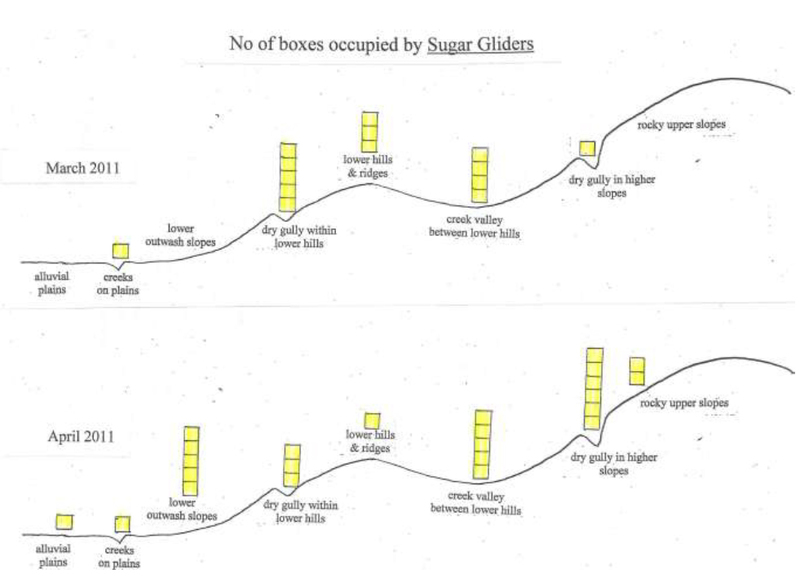 The extra boxes will also provide crucial shelter for juvenile gliders when they leave their parents' territories at the start of the next breeding season. Regular checking is important so that we can find the extent of local populations, the habitats they prefer, the breeding success of particular colonies, and barriers to their movement across the landscape. We also need to get accurate reports of unwanted species (such as feral bees) taking over our boxes, so that we can remove them at a later date. So any major breaks in the tree cover along roadsides or creeks become serious barriers to glider populations. Isolated 'islands' of habitat have proven empty, because gliders are taken by predators and there are no possibilities for replacement! Solid information like this makes it possible to know what needs doing and also where to do it to make the most difference. We are interested to know what type of vegetation and indeed the type of landforms that are most suitable for the Gliders and Phascogales. So our monitoring groups this year will be assessing the habitat around each nest box, looking at things like the type of trees, the extent of forest cover, the amount of understorey shrubs, and the position in the landscape. 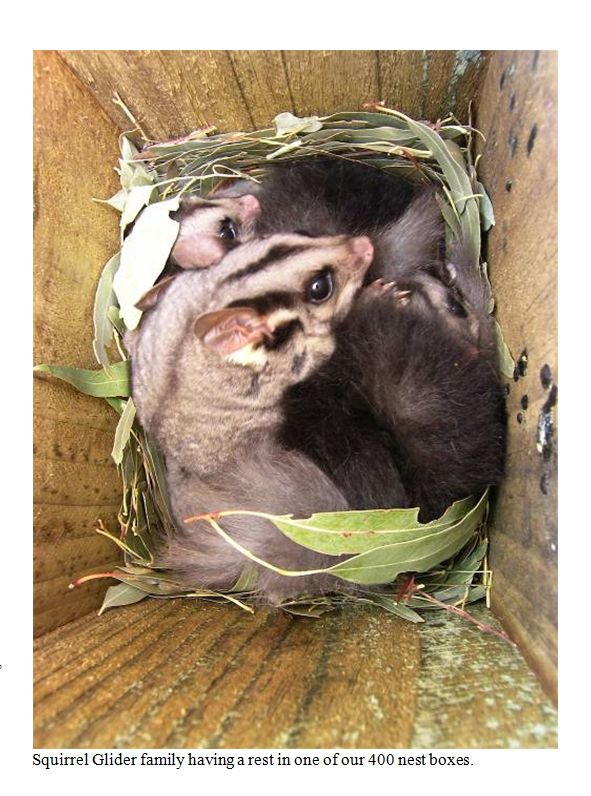 We will also monitor 30 extra boxes that were specifically designed for Common Ring-Tail and Brush-tail Possums. These boxes are all located in heavy mistletoe infestations to re-establish a population of these hungry possums as a natural biological control for mistletoe. Most of the box locations have been recorded by GPS, so future groups can find the boxes more easily. If you bring a GPS unit, it will also help confirm some locations that are a bit uncertain. Please use the GDA 1994 co-ordinate system to fit the new digital maps we have. These weekends provide an excellent opportunity for bush walkers to practise their map reading and navigation skills while looking for the nest boxes. The sites are all mapped carefully on 1:25,000 contour maps and brief access and location descriptions. So do come and join us. It’s the perfect opportunity to see these beautiful little animals up close, and the data collected will help us refine our habitat works. It’s also a good opportunity for you and your friends to meet some new people, while you’re all having some fun together in the great outdoors. •	Seed collection from 50 or so species, including several rare species. We were also fortunate to gather bulk amounts of many species that have been hard to get in previous dry years. Our aim has been to broaden the genetic diversity of our seed collection, and we'll continue to use it to establish our own "seed orchards" on the more intact sites. •	Seed cleaning went very efficiently this year with the use of specialised equipment at the Dookie Seed Bank. Our own seed bank has extensive collections from many species collected from a very broad range of sites in and around the Lurg Hills. •	Recent talks from Dr Linda Broadhurst from CSIRO Canberra, have confirmed our insights about the genetic implications of seed collecting and the directions we have been taking for the past several years. We collect seeds from the biggest and most diverse populations known to us, to ensure we are planting the broadest possible gene pool for each plant species. This should give our restored habitats the maximum potential for evolutionary shifts in the face of future climate change. •	Propagation with 20 local schools has already produced over 40,000 seedlings. We successfully trialled a new potting medium last year and this year we are further refining the seedling treatment with highly specific fertiliser and moisture levels for every plant species. We are getting fantastic healthy growth on all our species, but it's especially noticeable on the Bush Peas and dry-country Acacias that are easily killed by excess nutrient & water. •	Community education work continues with farm visits to talk about the ecological issues that are evident in each district, possible habitat protection and enhancement works, and benefits to the farmer. Our community education work also extends to recruiting and nurturing our small team of regular local volunteers who work with us 1 or 2 days each week. The input from such people over 16 years has been extraordinarily important for delivering the outcomes we can achieve with the grant funding available. •	Articles in the local newspapers and interviews on regional radio have advertised our nest box monitoring weekends and school propagation days. We've also ran a series of articles in the Lurg district newsletter about topical ecological issues such as Dieback and Mistletoe, and the benefits of enhancing biodiversity on farms. •	Schools have made enormous input to the seedling propagation as always, and we have given many presentations to classes about our key threatened species, what we can do to help them, and the successful outcomes from previous years' work. •	We have arranged further contacts with 3 schools to involve the students in deeper studies and activities across several curriculum areas, including woodwork for nest box repairs, artwork graphic design and for our planting trailer, advanced horticultural techniques for middle secondary students, computer work on our nest box records to develop data analysis and graphing skills. •	I gave a presentation about our project aims and successes for 3rd year students at Latrobe University to bring a practical focus to their theoretical studies. This was the first of many such presentations for the year, and it will lead on to a 2 day camp in our project area later in the planting season. 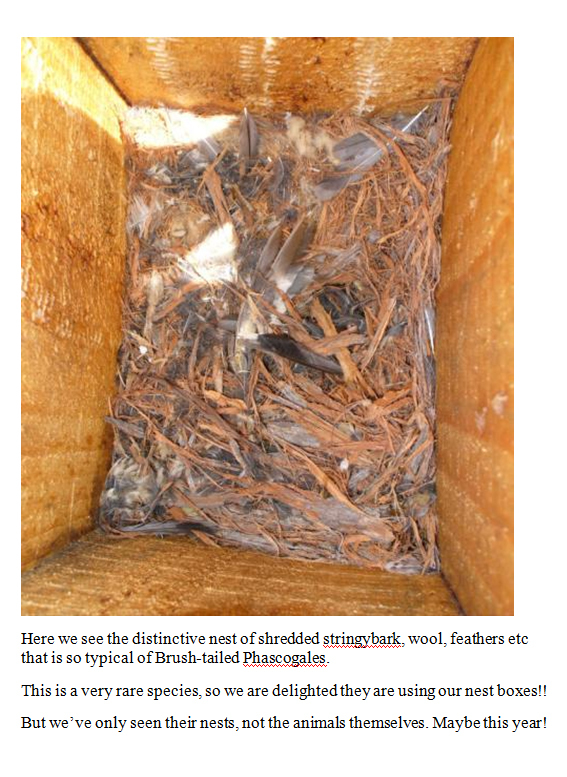 •	Nest box monitoring in March and April involved over 90 people in total. We've checked all 382 boxes at least once, and many of them 2 or 3 times. This enables us to continue our research into habitat preferences for each species and gives us powerful insights into strategic restorations actions to take. 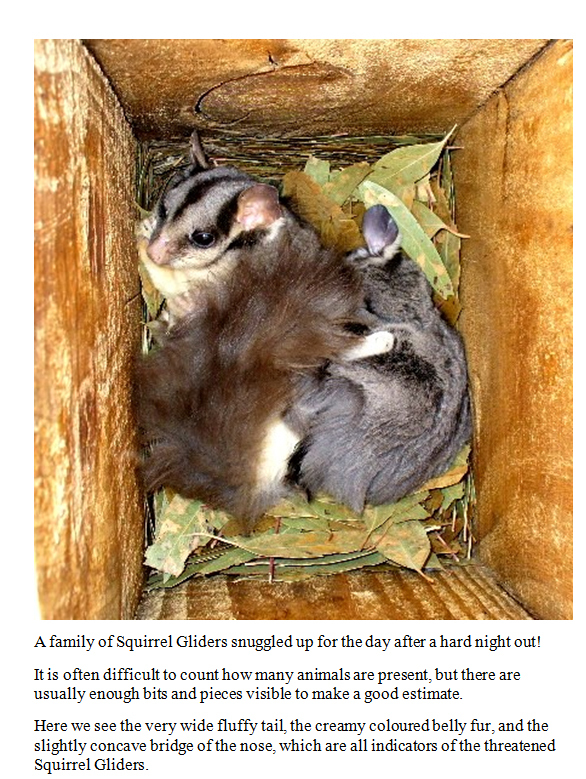 •	It was fairly clear that the dry hill country had more gliders at home than in the previous drought years. We also saw many juvenile Squirrel Gliders out on their own and some had even found a mate already. It appeared that the parents had begun to start breeding again earlier than usual because of the better food availability. •	We've become increasingly concerned about the need for cooler conditions in our boxes during the hot summer months. We need to match natural tree hollows where the temperature fluctuates as little as a few degrees. So I carefully relocated a number of trial boxes to better shade in 2010 and was really pleased that my efforts had attracted Gliders in every case!! We are treating careful box location as a critical habitat element not just an optional extra. •	Follow up work since the nest box weekends includes repairs and replacements of older boxes, relocations to provide better shade in the summer, removing feral bees from boxes (over 70 out of 382), and destroying a few families of Black Rats that could develop into a serious outbreak. •	Several volunteers with deep IT expertise are developing a new database to manage the mass of nest box occupation data that extends back to the mid 1990's. This will add more power to the possible research investigations, and will develop into several university research projects. •	I've been visiting and revisiting landholders to arrange the best possible fencing and planting sites for 2011. The main focus is as always, protecting and enhancing remnant habitat, but also includes sites that create strategic wildlife connections. •	Many of our other sites are significant for the extra bulk they provide in localities that are otherwise dominated by linear roadside strips! This careful selection process just keeps changing the landscape for the better, year after year. •	I've been intensely involved with detailed site measurements, accurate mapping, calculating fencing and planting requirements for the year, and making sure the Federal Grants to our farmers will cover the year's undertakings. The list of 2011 works is almost finalised, with over 20 sites to plant and there are still a few undecided. We see the enthusiastic involvement of many new people as a sign of healthy growth for our Project. •	Fencing has been completed on 2 sites already and posts are being rammed on many others at present ready for the wires to be run out when we have some extra volunteer helpers. •	Mistletoe pruning is almost completed on 3 major sites, to prevent inevitable loss of old trees that are the core of the local Box-Ironbark habitat. We undertake this pruning as a short term strategy to relieve the stress on severely infested trees, and follow it up by understorey planting to provide ecological balances for the long term natural control of mistletoe. •	Environmental weeding in habitat sites focuses particularly on woody weeds such as Tagasaste, Pine Trees, Robinia, Cootamundra Wattle, Willows, Prunus, English Ash etc that have invaded roadsides or creek lines where we'll be planting. •	Arranging sponsorship for a solar panel and pump to provide off stream watering for farm livestock. This will enable the farmer to fence and revegetate a small creek line that is a crucial habitat link. •	Arranging a special planting/birding weekend for Bird Observers' Club and Birds Australia. As well as giving birders an opportunity to help the creatures they love, the weekend will also enable people to meet members from the other group, and enjoy birding in some of the 450 sites we have restored over the past 17 years. •	The crash barriers for our Freeway wildlife crossing have been installed, and I have begun the process of site preparations including woody weed removal, chipping the debris, and traffic control procedures to ensure our workers' safety. •	Liaising with the local CFA to carry out an ecological burn of a partially degraded bush site. Our 2 previous burns have produced massive germination of soil-stored seed and rejuvenated a heathy shrub layer that has been missing for decades! Unfortunately the extra rain this summer has produced too much green growth, so the site will have to wait for drier conditions next autumn! •	2 briefing sessions and a guided tour of our project area for the new Environment Manager and Environment Strategy writer of Benalla Shire. These sessions provided a valuable opportunity to introduce Shire personnel to the ecological values and threats for which they have responsibility, and promote the obvious synergistic benefits of working together on environmental issues in the Lurg Hills. 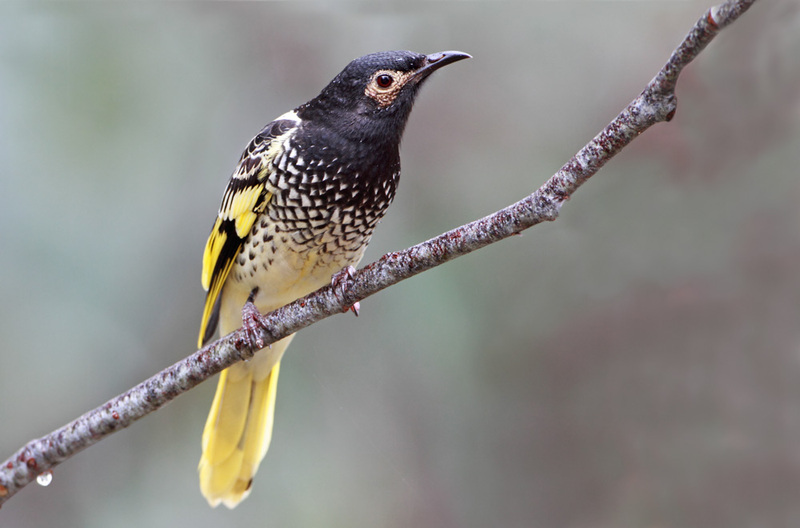 I've just heard the wonderful news of 2 further Regent Honeyeater sightings in the Lurg Hills, one near the Quarries and the other a few km south of Greta West. The copious Ironbark blossom this year has attracted hordes of honeyeaters, so it was really just a matter of time before someone spotted a Regent. An earlier Regent sighting was during Easter near Kelly Gap, where it stayed for a week on the Ironbark blossom once again. So there are surely others out there in the hills, no doubt hiding from the more aggressive honeyeaters. And that's where our denser plantings really help, by giving these shy birds the cover they need to get a fair share of the honey. These birds are so elegant!! • Emailing news to all our volunteers about wild Regents coming to Lurg – 3 sightings now!! With thanks for your wonderful support that keeps us in the running! 17 monitoring zones (entailing 240 boxes) were checked in mid March and then again in mid April. We found changes in box occupancy rates, family group sizes, age classes, and distribution across the terrain. Perhaps there has been an "immigration" of Sugars? But we saw no sudden loss of Sugars anywhere elsewhere in the district! There was a disproportionate rise in no of paired Sugars, so it clearly was the start of mating for both the box-dwellers and the "immigrants"
Sugars (being smaller) lose body heat faster, so they move to higher ground to keep warm! First and foremost a huge thankyou to the hundreds of willing volunteers who helped make the planting weekends such a powerful force this year. It is truly amazing to see the enthusiasm and sheer strength that people display in all sorts of terrain and all sorts of weather too! Approx 320 people came to help on the 4 big w/e's, working on 9 different sites to restore almost 26 ha of habitat. That equates to around 18,000 seedlings!! On several of the weekends, the group worked so quickly that we finished the planned w/e's work in just 1 day, and needed to move to another site for the Sunday! You might like to check our website to see some up-to-date photos of the action. I think you'll be inspired! Sincere thanks from our project team & from the landholders - they clearly believe in the biodiversity outcomes, but could never achieve them on their own! Finally, if you do have some spare time and energy, you might like to come up for a day or two in sunny NE Victoria to finish off some small planting sites that were too wet to plant earlier in the season. With the weather getting warmer, and the skies so brilliantly blue up here, maybe you'd like a few days in sunny Benalla, helping us to finish off sections of several sites where the soil was too wet earlier on. But warm weather brings a degree of urgency - we need to get the seedlings planted very soon, before the ground dries up!! Being on the more fertile flat country, these sites will become the best possible breeding habitat for rare species like Regent Honeyeaters, Grey-crowned Babblers, Squirrel Gliders, plus a whole host of threatened woodland birds. So it's crucial that we finish them off. Working in a smaller group like this is an easier pace than our big planting weekends, and it's a great opportunity to make some new friends. We finish each day with a BBQ and a relaxing stroll on the shores of delightful Lake Benalla - maybe even a swim if it's warm enough! So grab some friends and come for a day or so. You'll be surprised how effective a small team can be!! Thanks from Ray Thomas and the Regent Honeyeater team. • So far this year we've had 27 planting days involving 20 schools, and with the wonderful extended rains, we are launching into a few extra school planting days next week. Well over 1000 students have been bussed out to the Lurg Hills and more than 12,000 seedlings have been planted. • This has the educational advantage of giving students a real sense of achievement and empowerment as they look back at the end of the day to see the enormous amount they’ve done. Doubling up classes also saves on bus fares, which is crucial now that fuel prices have gone up considerably! • We always present educational sessions for the students while they are out in the field, to capture their imagination and increase their connection to their local environment. • We work mostly with primary and tertiary students, but the secondary level has remained largely untapped. • So I've been delighted that several secondary teachers from Benalla, Wangaratta and Shepparton have chosen to involve their students in our project. It's great that students are being given an opportunity to learn about local ecological issues rather than text book theoretical exercises, and then to get involved in the hands-on action. • We gave detailed ecological talks/slide shows for the students of 4 secondary colleges in all, as preparation prior to the planting trips. • Our community planting weekends attracted approx 50, 60, 75 & 135 people respectively. The energetic bushwalking groups and university students enabled us to plant approx. 12,000 seedlings over the 4 weekends. Again we give ecological presentations to the volunteers during tea breaks, to increase their appreciation of the particular values of each restoration site, and how their efforts are strategically focussed to give the best outcomes for our threatened species. • Your funding assisted greatly with the catering, which was expertly provided by the staff and students of the local TAFE hospitality course. This connection is a wonderful win-win situation for all concerned! • We use direct seeding quite selectively whenever we want to establish the missing understorey species amongst remnant trees, because in those circumstances the moisture competition is too severe for planting to succeed. 2 big sites were direct seeded by machine towed behind a 4WD wagon, and a 3rd was seeded using mattocks to chisel a divot in the soil. • We also sprinkled fine seeds such as Everlasting Daisies, Kunzea, Calytrix etc in the better native grass areas on many sites. The open soil patches between individual grass tussocks provide the perfect micro-climate for seed germination, so we expect massive cover of these under-represented species by next spring! • We have already observed germination on direct seeding sites done as recently as 2 months ago, and there'll be a whole lot more now that we've had so much good rain and warm sunshine. This year is just perfect for plant growing!! • In addition to our rare birds and mammals, the Lurg Hills has quite a number of plant species that are rare or drastically reduced, and these need protection just as much as the wildlife. Careful seed collection and scrupulous propagation leads us to the wise choice of safe sites where these species have a good chance for on-going self perpetuation. • We've again chosen weed-free areas within our fenced planting sites, and planted hundreds of these rarer seedlings including Leafy Templetonia, Deane's Wattle, Tall Grass Tree, Hoary Sunray, Native Flax, White Cyprus Pine, Spur Velleia, Basalt Podolepis and Swamp Billy Buttons. • To minimise the chance of in-breeding, we've gathered the broadest range of seed genetics available to us for each species, and will add to them as further seed sources are found. So as well as making high quality habitat, these sites will be very important seed sources for our revegetation work in future! • The Birds Australia survey in early October once again broke a record, sighting 128 bird species in a day and a half!! 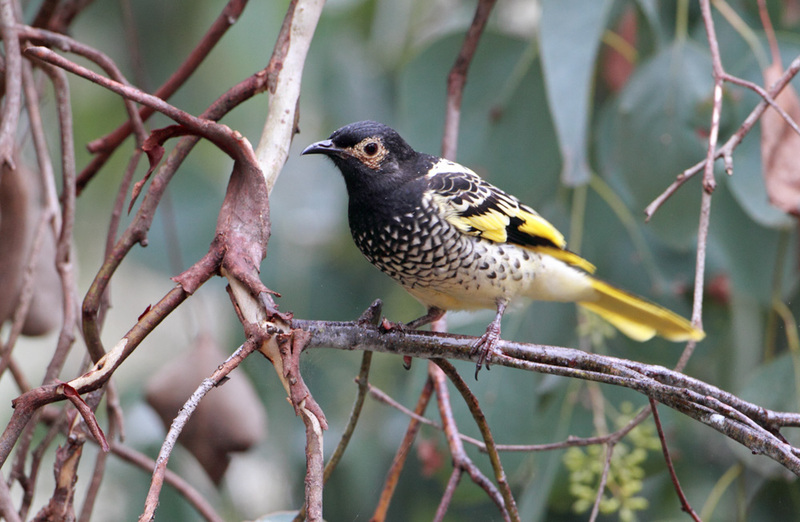 The organisers Dean Ingwersen and Chris Tzaros are quick to point out that there appears to be no other place in Victoria (or perhaps even Australia) where a rural landscape is supporting such a diverse bird population. It certainly validates our long term input to shore up the existing habitat and improve the breeding potential of many species that are doing it tough in these drier years. • I have already talked with or visited about 5 landholders about projects for 2012 and there are more in the early planning stages!! • The focus is (as always) on enrichment plantings to add the missing understorey, connecting remnants, widening narrow remnants to buffer them from external disturbances and boost their habitat value, planting densely to break the dominance of aggressive Noisy Miners, and planting on fertile soils to produce better wildlife food reserves. • Our major focus this trimester was to complete all our planting sites, and we had mighty assistance from many schools and small groups of university students who came when they could fit it in around their exam timetables!! • Tallies for the planting season include 32,500 seedlings planted on 23 sites, to restore almost 70ha of habitat, and involving 1,673 people. • We've reconnected with 2 secondary schools that haven't been involved for several years -Wangaratta HS and FCJ College. I gave pictorial presentations for all year 7 students and then involved them in the planting and watering. This will be the start of an ongoing connection with their environmental studies. • Project tour for Ballarat Tree Growers to see the how, why, where and what we do to incorporate biodiversity enhancement into our tree planting. • Project tour for Alpine Valleys Community Leadership Course to see what we do for threatened species, and how it relates to sustainable land use. • Involving year 7 "special needs" students from Benalla College in our watering and nest box monitoring. Again this will be the start of an ongoing connection with this part of the school's work. • Involving a small group of year 9 students from the "Community Leadership Challenge" course at Wangaratta High School. The team came 1 day each week for most of 4th term, assisting with our primary school planting days. Again this will be the start of an ongoing connection with this part of the school's work. • Local newspaper article explaining our planting work to create a Freeway fauna crossing. • Local newspaper article showing students in the "bucket brigade" helping to water a planting site. • Newsletter produced, to keep our supporters up to date with what their individual efforts all add up to. • Planting the median strip and verges of the Hume Freeway was started back in early winter, but the low lying areas had to be postponed until they dried out in October. The crushed rock road batters were pretty tough growing conditions, but the first batch of seedlings were looking good with healthy new growth tips! • Thanks to Vic Roads for their support with this crucial project. It will help Squirrel Gliders and other threatened species to cross the road in search of new territories and breeding partners. • 3 years on after our initial thinning work, we have revisited the forest site near Kelly Gap, to survey the ground cover plants in both the treated area and the untreated "control" area. It was obvious at a glance that the native grasses have sprung up due to the extra light and moisture, but we proceeded with our annual scrupulous searching of 24 quadrats to see what other differences might come to light. • We noticed that the untreated forest has a thick cover of dead leaves and sticks which is clearly preventing germination of any new understorey shrubs. It's not a very rich habitat. On the other hand, the disturbed soil in the treated area had many young pea and wattle seedlings that have clearly germinated from seed that's been lying in the soil for decades! • We'll return in autumn to measure the trunk diameters of about 80 tagged trees in the thinned area, and compare those with another 80 tagged trees in the un-thinned area. A thorough statistical analysis will be undertaken after that, with recommendations for a second thinning effort to scale up the work from a trial to a more serious "habitat production" basis. • Already I have 17 projects set to start for 2012, and at least a dozen more landholders are thinking about the ideas, the costs, the benefits, the timing etc. The process always gives us more than enough projects, so we can choose the sites that will make the most difference for our threatened species. • In the past 12 months however, Benalla Rural City has developed a new Environment Strategy which identifies among other things, a need to protect and support threatened wildlife in the Shire. • So I've re-opened discussions by requesting an opportunity to present to council about the importance of this work, the successes we've already had, and the prestige value of this natural heritage for the Shire as a whole. I've also made a formal application for a permit to plant the open gaps on 3 or 4 specific roadsides next year. • One of our creek planting sites from 2009 has been "choked out" by a massive germination of River Red Gum seedlings that sprouted en-masse in the bare soils along the rip lines. A few extra seedlings would have been nice, but thousands and thousands of them are crowding out our planted seedlings. It's virtually a mono-culture with much reduced habitat value, so we started a trial back in June to thin the saplings by chain-sawing the saplings and poisoning the stumps. • Our recent visit to the trial site showed very promising results, with only minor re-sprouting of the poisoned Red Gums, and very strong growth on our planted saplings. Some of these are now 5 or 6m tall with about 1m of new growth, so they'll clearly out-compete any little Red Gums that have survived the cut and poison work. • It's time-consuming but definitely worth preventing the same dense forest blocks that germinated after the 1952 bush fires! • Each year we take on some direct seeding as a complement to our planting work. The aim is to establish some extra understorey shrubs into treed areas where traditional planting just doesn't work. This year we did 3½ ha by machine on 2 big sites, and several more sites by hand. The manual process was as simple as sprinkling seeds along the bare soils of the rip lines, particularly choosing spots where the absence of weeds would give our little seedlings the best chance of survival. • So we've been out checking to see how last year's sites are going and have been delighted to see rows and rows of young seedlings sprouting amongst the older trees. And the hand sprinkling work has produced clumps of daisy bushes every few metres on the driest gravelly soils, often several species growing together! • Our biggest contribution is working side by side with landholders to undertake rabbit control on and near our planting sites. We are careful to explain the process, to demonstrate the practicalities of doing the job safely, and always revisit each site several times to ensure the rabbits are declining. This is the best encouragement for people, by showing that it really does work. • We've also been attacking woody weeds such as Pines, Blackberries, Robinia, Cork Elm and Tree Lucerne that threaten native bush areas and planting sites. The work has involved chain-sawing, poisoning stumps, man-handling onto bon-fire heaps, hand pulling and spraying. • An important project to fence and plant a creek line has finally come to completion with the installation of a solar powered water pump to supply water in the adjacent paddocks. The McMonigle family has been generous in fencing off their creek line and farm dam for habitat purposes, so it was tremendous that a local solar company "Outlook Alternatives" has matched that good will with reduced prices and free installation. • Our annual bird survey weekend in October found a record number of species, almost 150 in total, including a range of threatened species as always. Significant findings for this 7th survey included lots of nesting birds, lots of juveniles already on the wing, heaps of honeyeaters, and many migratory species. This, together with the 2 earlier of Regent Honeyeater sightings, says a lot about the value and condition of our Lurg Hills habitat. The birds are coming here for good reasons!! • Thanks to the Birds Australia team and their volunteers for their long term insightful research, and to the landholders who kindly allow us to search the bush areas on their properties. • Enthusiastic volunteer Chris Schirlinger has totally redesigned our nest box database to a new format that enables quick sorting and sifting through our massive collection of occupation data that extends back to 1996. Another volunteer Vicki Koller, has assisted greatly by meticulously entering all of our paper copy records from the most recent years. • And we've had our first trial of the system to answer a landholder's questions about the particular species that are being found on or near his properties in Glenrowan West. "If I decide to go ahead with some more conservation work, will it really make any difference?" It's a very good question, because you need to know who is home before you know what actions will be most helpful. You also need to know where they are living, (and where they aren't) to decide where the works should be to make the biggest impact. • To date we have several years of occupation data entered for all of our 400 nest boxes, but soon this will extend to rapid access to 15years' worth of data. A quick printout of records around that locality will give us some solid facts to refine our intelligent guesses! • With an already sizeable seed collection in store, this year we are specifically targeting plants that are poorly represented in the Lurg Hills. The aim is to import extra genetic stock from large populations elsewhere in the region to make sure our Lurg Hills plants avoid the problems that arise from in-breeding. Special thanks to the many landholders who are keeping a look out on these special plants that really are part of our heritage! • We are also collecting from species that haven't set seed for several years, to build up stocks while the seed is available. • Sowing the seeds of all 40 or so species is occurring this year with a staggered timing approach. Slower growing peas and wattles have been sown for several weeks and are germinating well already to take advantage of the better growth conditions over the hot summer months. • Andie is carefully scarifying the hard-coated acacia and pea seeds with emery paper, soaking them in water overnight to look for swelling, then sowing or re scratching as needed. • Andie and our long term volunteer Gary have just fitted our 3 hot house structures with shade cloth and automatic watering systems to look after our seedlings over the summer. As well as the new 2012 crop, we have several thousand plants left over from 2011, mainly because 3 sites couldn't be fenced in time for the planting season. But the seedlings are healthy and will make a great start for the 2012 season. • Our friendly CMA staff have been championing our cause to the federal funding bodies, showing just how much our work fits national priorities in so many ways. The latest initiative is updating the map of all our work sites from 1995 to the present, and overlaying that with remnant vegetation cover. It shows just how precisely our works are connecting the major forest blocks to one another, how we are targeting the depleted vegetation types that need the most help, and how we match computer models of natural values "hot spots" that need protecting. • We clearly aren't working randomly all over the country without co-ordination, but rather with strategic plans where we'll make the biggest difference. This very detailed map tells the story in full graphic colour! •	Our tree guard supplier decided they would donate the 2 li cartons to us as an in-kind sponsorship. •	The Ovens River Landcare Network offered to cover bus fares of all the schools coming tree planting from Wangaratta. This gives us the opportunity to put more funds into other areas that also need support, specifically fence post ramming, fencing materials, fencing labour, direct seeding, planting tool repairs, woody weed clearing, and chipping woody weeds on Freeway site. The table below shows the original budgeted amounts, and my suggestions for funding variations for 2011. • Seed collection, cleaning and storage: of the mass of seeds collected over summer. We had a targeted effort to collect from all the rarer species that are poorly represented in our district, to boost the genetic diversity and keep our currently isolated populations healthy. We've also been lucky to make huge collections from some species that haven't seeded for years!! • Propagation with schools: We have already worked 7 days with schools, involving ca 620 students, with as many as 7 classes back to back all day long! It's great to see the level of enthusiasm and concentration as each class works solidly at it for an hour. Many other schools are already booked in over the next few weeks, including a couple that haven't been involved for several years. • Assisting teachers with their curriculum projects: I've given detailed advice to staff at Goulburn Valley Grammar about design features and ecological principles for transforming a muddy artificial lake on their campus into a real wetland. Not my usual sort of project, but it's good to give them some help with a valuable education project that seems to have stalled through lack of knowledge. • New processes in seedling propagation: Our nursery manager, Andie, is having more and more success with trials to find the optimum nutrient and water regimes for all those "difficult" species. He's also introduced new seed germination trays to improve the "potting up" process – easier for younger students particularly, and far less root damage for the seedlings! • Progress with our nursery equipment: The extra benches have been built from recycled steel that was donated to us, and they are very professional! Andie has installed a tried-and-true 2nd hand watering system for the 3 propagation igloos, so the hot summer weekends are not such a worry now. And the latest development is small shade cloth "tents" on poly pipe hoops over the seedling benches. This provides double-shaded, cooler and moister conditions for the seedlings in their first 2 weeks after the potting up. • Farm visits to finalise 2012 projects: We have 22 confirmed sites, with 7 more families still deciding. In many cases the sites are joint efforts between neighbouring landholders so it has a much bigger ecological effect. I've begun measuring and mapping each site to arrange CMA fencing and planting grants for the landholders, but the paperwork for the grants would be too much for me. So I'm sincerely thankful to DSE Biodiversity staff who have offered an admin assistance to take it on! • Roadside planting sites: The issue is still being discussed at Shire Council level, but Benalla Shire Council has welcomed my offer to give a presentation re our project aims, achievements, and the strategic importance of planting gaps in roadside habitat. • Fencing works: 4 sites already completed or in progress, and the Beechworth Prison work crews are helping substantially with several projects this year. • New ecological thinning sites: The prison crew has already thinned the over-dense Ironbark saplings on a ½ha planting site in Lurg. It was originally intended as a woodlot, but the new owners appreciated the habitat value so we took out about 30% of the stems and will direct-seed the missing understorey in winter. We have several more thinning sites in the pipeline for this year. • Mistletoe pruning: The successes from previous years are astounding, and people are taking notice! So I've talked with a few landholders already about removing the mistletoe, and contacted the tree climbing contractor to start work on several major sites soon. 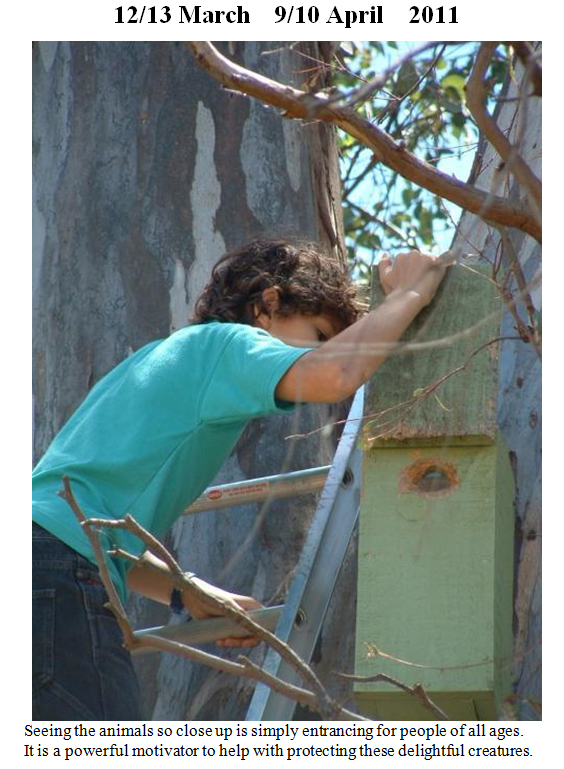 • Nestbox monitoring: I'll be contacting schools, landholders, volunteer groups and the media shortly, to invite people to our nest box checking weekends. The wet summer should have produced a better breeding season so it will be interesting to see the results! And couple of our volunteers have been very busy over summer too, entering all the old nest box records right back to 1996!! That will no doubt lead to interesting research results. • Nest boxes: We've shifted an extra 25 boxes into better shade to provide the essential cool conditions needed by Gliders over summer. Badly located boxes are simply unusable, so it's a waste of a critical wildlife resource. We've also taken down several other boxes for repairs, and placed a few new ones to give new landholders a chance to see these creatures on their land. I've worked very carefully with local volunteer Nigel Lacey and Jill Smith of DPI, to produce an updated Nestbox master map, with all the new locations and access descriptions for our volunteers. • Breeding survey of Grey-crowned Babblers: Nigel has again scoured the district for all the Babbler families and seen promising signs of breeding last spring. He's been particularly pleased to note the dark eye colouring of young birds, and even has records of older yellow-eyed birds breeding with dark-eyed young, which must have immigrated from neighbouring groups. These are all healthy signs. • SER promoting our work internationally: I've just been contacted by the international "Society for Ecological Restoration" seeking permission to promote our project's work on their website. We are just trying to do our best with the knowledge we gain from good researchers and from our own observations, but it looks like people are watching from far away! 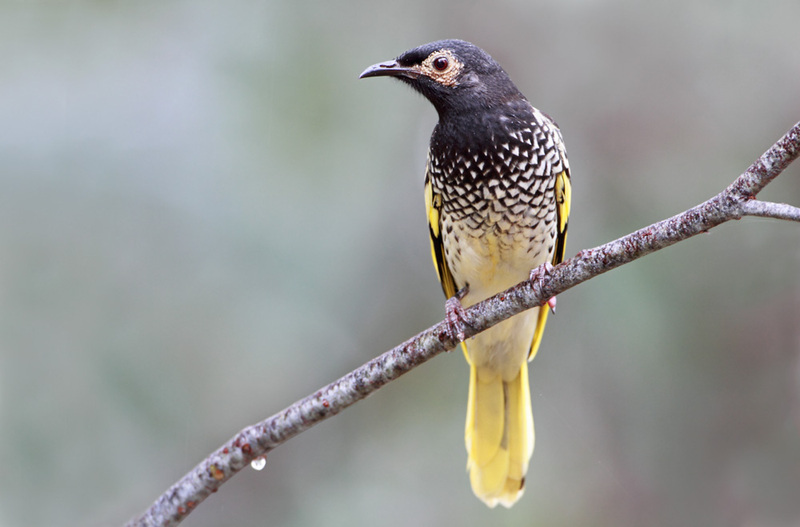 • Regent Honeyeater Newsletter: There is a lot to celebrate about our work in 2011, with so many individual projects combining and adding to the "big picture" outcomes we've been aiming for since the mid 1990's. Sincere thanks to all those who make this happen, and I hope you enjoy the reading! We've been busy planting all winter and spring, working our way down the catchment from the rocky hills that dry out most quickly, to the moister soils on the plains. Our community planting weekends have attracted 45, 85, 93, 94, and 37 people respectively. The bush walking groups and university students provided sufficient driving force to get approx 2571, 4275, 4609, 3982, and ca 3100 seedlings planted by lunch time on each Sunday! Our 21 school planting days involved 871 students & teachers, and planted over 12,000 seedlings. Since the school holidays we've been working away on the low-lying spots that were too wet to plant in the winter, often planting several hundred seedlings per day with only 3or 4 people! We always present educational sessions for the planting groups while they are out in the field, to capture their imagination and increase their understanding of the ecological changes they are helping to achieve. Your funding assisted greatly with catering on the big planting weekends, plus bus fares for local schools to be involved in the planting. These are strategic ways to encourage/facilitate/acknowledge active involvement! ......and there are still a couple of small wet sites to finish!! We have direct seeded 20 sites by hand, including a couple of sites from 2011 as a replacement for browsing losses by kangaroos. The slow and steady appearance of shrubs established by this approach, survive much better than planted seedlings where the tree guards just seem to attract attention!! We also direct seeded 1 site of 3ha by machine, adding understorey to a significant area of mature Grey Box trees. It will quickly develop enough understorey cover to be really valuable nesting habitat for Grey-crowned Babblers living in the area. One of our former Monash students administers a Facebook page specifically for our project, advertising our activities and sharing success stories about recent works. The "Couch Surfers" group found us through that medium and quickly arranged a sizable group to join us on the 2nd planting weekend just recently. ..In fact all the university groups are increasingly using Facebook to communicate about our activity weekends, and they are often the largest proportion of attendees. Our website is maintained and updated by one of our keen bushwalking volunteers, often with great photos of large groups engaged in our working weekends. This is our 2nd year working with the Wangaratta church which organises a camp during the September holidays for city kids to experience some country life. To complement their spiritual development activities, the teenagers participate in community service activities each afternoon, and they've arranged to come and make a difference for threatened species. We organise the tree planting, teach them about the wildlife, show them some gliders in a nest box, and visit some older planting sites to see how their efforts will look in a few years' time. Careful fertilising and watering to suit the optimum growth requirements for each species. Lots of size sorting and weeding to produce trays of even sized plants ready for planting lots. Preparing seedling batches for each site, taking into account the different soil types and moisture levels on each site, and indeed on different parts of each site! Future seed harvesting from these sites will have the broadest genetics available in the entire region!! This is especially important for the many rare plants we are building up! We intentionally cull out the smaller "runty" seedlings from our nursery stock, to remove genetic mutants that would have failed anyway in tough(er) conditions of natural regeneration. Monitoring of our older planting sites show these mutants continue their poor vigour, poor growth forms, and failure to thrive even 10-15 years after planting! We've also been astonished to see that quite a number of the canopy trees in our older plantings are multi-trunked, twisted forms, and it's not from a grazing incident with branching near ground level! With repeated dichotomous branching all the way up each trunk, it's become clear that all the good saw log trees were taken a long time ago, so the gene pool of our local Mugga Ironbarks for example has been skewed towards these poorer forms, especially where they have lower branches that are easily reached for seed collection!!! This summer we'll be intentionally seed collecting from the best genetic forms of these over-harvested canopy trees, to bias the genetics back towards forms that are now under-represented. Highly successful spraying work this year due to detailed calculations of dosage rates targeted to "kill" the toughest weeds rather than using the commercial label recommendations which aim for "suppression". This has made digging much easier for our volunteers, especially the school groups. With a new crop of weeds germinating in the spring, we did a 2nd spray of the final few sites. It made those planting sites really secure against weed competition, and sped up the planting work enormously. To help design our planting mixes for each site more efficiently, we reduce the choices down to a number of Broad Vegetation Types, based on topography and geology, with titles such as Upper Hills, Lower Hills, Gravelly Slopes, Loamy Slopes, Granitic Outwash, Alluvial Flats, & Plains Country. Sites that are clearly on an ecotone between 2 ecotypes, are allocated species from both, so that the different species will become dominant quite naturally on different parts of the site over time. We plant around 6 or 7 eucalypts that are typical of the Broad Vegetation Type, plus a range of acacias, peas, woody daisies, and other shrubs associated with those canopy species - a minimum of 30-35 species in total. But sites with relatively intact ground cover warrant an effort to establish extra species diversity, including the smaller shrubs that would simply be lost in weedy sites, and herbaceous species that are easily direct sown in the bare soil along the rip lines. The woodland bird survey in early October once again broke a record, finding several new species in their surveys of 155 sites across our project area. The organisers Dean Ingwersen and Chris Tzaros from the National Regent Honeyeater Recovery Team, frequently point out that our restoration works are setting a very high standard that other groups wish to emulate! It is the best possible validation that our aims, strategies, processes, techniques & research efforts are on track. I have already talked with or visited about 5 landholders about projects for 2013 and there are more in the early planning stages!! We judge that the scale of our habitat works in the Lurg Hills and surrounds is about the right size for us to manage each year, given the labour sources we can tap into. The whole project relies on the willingness of all our stakeholders to be involved, and I think that's built on trust & respect for our staff more than anything else. We are proactively expanding our volunteer base by running special events for groups such as scouts, bird observers, church groups, and university study groups. These events are our fastest area of growth. Our traditional support base of bushwalkers, university students, and local schools is also widening, as young people use their own networks to tell our story. We are seeing more international students, couch surfers, friends of friends, and we'll be targeting these groups more in the year to come. I trust this summary of our current situation will show that we are taking great strides in landscape restoration. It's fair to say that your confidence in our project has been rewarded, indeed honoured, with the recovery of several threatened species in our district. • Seed collection issues: Andie did germination trials on lots of our older seed stocks to see if they were still viable. The hard-coated seeds like peas and wattles are very long lasting, but the finer/fluffy seeds can deteriorate in a few years. So we've targeted particular species to replace any old stock. Producing 40,000 or more seedlings each year, gives us the perfect opportunity to study the extent of genetic variation in various plant species. Eg, of the 3360 Mugga Ironbarks we grew last year, we were left at the end of planting season with 515 deformed plants that we judged as not worth planting. With reduced leaf size, a dwarf shrubby appearance, and complete lack of a single leading stem, they were clearly not going to be a full size tree, and probably would be infertile as well!! Even worse results were found for other common species, indicating that we already have "inbreeding" depression, most likely due to isolation and the inevitable self-pollination or crossing with daughter plants! So we had a targeted effort to gather seed from as many different "mega" populations as possible this summer, especially where we see particular species are rare in the district or always growing in isolation. It's given us unprecedented amounts of seed that will enable broad-scale revegetation work with many species that were always in short supply. The process has required a lot of travel, firstly to find new plants, and revisiting them several times as the seed matured in stages. But it's the only way to ensure our habitat areas will have enough genetic diversity to cope with whatever environmental changes they will face in the long term! Our proactive steps on these issues over recent years, is already showing the benefits. Some very rare plants have been so isolated and severely inbred, that most seedlings we grew just failed to thrive and eventually died in their pots! We are now getting healthier and more vigorous seedlings in the nursery, and after planting them out in close proximity with "their peers", we are getting bumper seed crops that were never found on isolated plants! It seems the pollinating butterflies, moths, birds etc were simply not able to transfer pollen between the isolated plants, but closer planting promotes cross-pollination and its associated hybrid vigour! We have already worked with 14 schools, involving close to 1000 students in all, and we already have around 25,000 seedlings safely in the nursery! We take care to always focus on the positive results from students' efforts in previous years, and are constantly delighted with their real enthusiasm for doing something to help nature. We have several other schools already booked in over the next few weeks, and a couple more still to confirm. I'm very aware that schools have more and more pressure on their curriculum time, so we try to make sure there are real educational outcomes for the school. We tailor each session for the particular age group, building on students' existing knowledge, and taking them to new understandings/concepts/attitudes. It's been very encouraging that several new schools have invited us to work with them this year, and I've arrange to give presentations to staff at 2 other schools that have been closed to us for years. The local Catholic College is a good example, where the enthusiasm of 1 teacher has paved the way for other staff. Our nursery manager, Andie, is having more and more success with his trials to find the optimum nutrient and water regimes for all "difficult" species. Peas and wattles from the dry hill country just hate being in pots, most likely due to excess water and fertilizer, so he sprinkles carefully judged doses of the appropriate NPK fertilizer and keeps meticulous records to look for comparisons later. Because of this work, we've been able to plant hundreds of vigorous healthy Davesias, Eutaxias, Kennedias, Rough Wattles, Thin-leaf Wattles etc. And these species certainly don't cope with root disturbance either! Our new "512" seed germination trays confine the roots in separate tiny pyramidal containers, 1cm wide and 2½ cm long, each with fine grooves to keep the roots running straight. In only 6-8 weeks the roots form a firm "plug" which is easily transferred into a growing pot with very little root handling. It's much easier for students, more fun, and far less damaging for the seedling roots! Comparisons with traditional root trimmed seedlings show double the growth rates!! We have 12 confirmed sites, with 6 more families still deciding. It's obvious that people are very much occupied with the long drought, so the focus is on protecting livestock and reducing fire risk. I've begun measuring and mapping sites to arrange CMA fencing and planting grants for the landholders, but only one site is fenced so far because of the high temperatures and severe fire risk in dry grass. I've arranged to give a 30 min presentation to Benalla Shire Council about our project aims, achievements, and the strategic importance of planting gaps in roadside habitat. I'll draw attention to several threatened species success stories resulting directly from our earlier roadside plantings. I'll also seek official approval for further plantings to fill strategic gaps in roadside habitat this year. Invitations are out and we already have lots of bookings for our 3 weekends. We even have a film crew coming to document the whole process and so it can be shared with other groups who are just starting out with a nest box program. The dry summer will have no doubt created extra difficulties for the wildlife, but we need to see where the problems are, so we can understand how we can assist most effectively. That will no doubt lead to interesting and valuable research results. and the Regent Honeyeater Project Team.